Well, more like since about a month ago when we launched NuggMD, but that’s beside the point. We’ve created a convenient, private, and professional way to get your doctor’s recommendation (or renewal) entirely online. How? 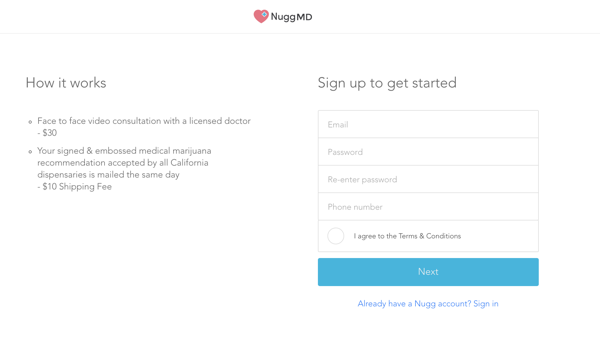 Just create a secure account (or login with Nugg) at NuggMD.com, then video-chat instantly with an online doctor who’ll help decide if cannabis is right for you. Your information stays private, evaluation usually take just 5-10 minutes, and our highly knowledgeable doctors have helped tens of thousands of people understand the medical benefits of marijuana. Visit NuggMD.com and you’ll find a simple, clean website tailored to cannabis patients of all ages. You’ll notice we offer a medical cannabis card for just $39, which is up to 50% cheaper than what you’ll find walking into a traditional cannabis clinic. We’re able to do this by partnering with doctors who are compassionate, well-informed, and excited to move the medical marijuana industry forward. Keep in mind that if you already use Nugg, our separate-but-affiliated site that lets you order cannabis delivery online from dispensaries in your area, you can just login with your existing profile. Rest assured, your information is secure (we store it in a HIPAA compliant database), confidential, and only shared with the doctor with whom you have your cannabis evaluation. If you’re skeptical about submitting your private health information online, we don’t blame you; it’s a new concept that demands trust from both sides. Unfortunately with cannabis, traditional doctors are neither informed nor equipped to serve patients that may benefit from using it as medication. In fact, most patients either don’t know how to ask their doctor, feel too uncomfortable, or have been scared off by stories of friends encountering hostile responses from their doctors when inquiring about cannabis. So by offering an online solution for medical marijuana evaluations and doctor recommendations, we hope to provide the convenience and personalized attention that traditional health care just can’t. It’s our mission to give you a professional, private, and comfortable experience by connecting you with a knowledgeable doctor who welcomes your questions about cannabis. And the best part? Your one-on-one consultation with a California, board-certified doctor starts immediately when you visit our website. 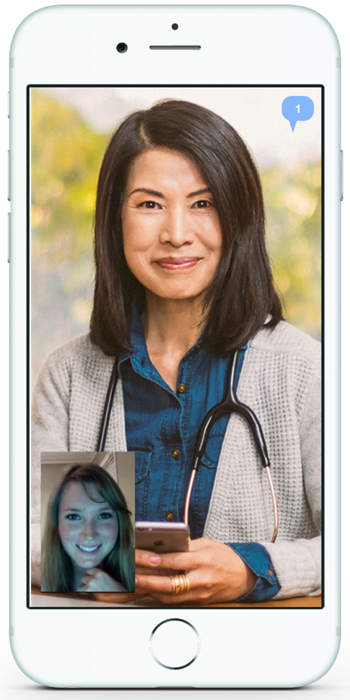 You’ll find a chat feature on the right-hand side that allows you to live-chat with a doctor before going any further in the process. Feel free to ask him or her about cannabis in general, the medical uses of marijuana, how the online doctor process works, or anything else that’ll make your experience more comfortable! Even if you don’t choose to conduct your medical marijuana evaluation online, you’re still able to get all your questions answered quickly and in one place from a trusted doctor. On the first screen, you’re asked for basic personal information that we’ll need to confirm you’re legally eligible to use medical marijuana in California. After providing your basic info, the real fun starts—describing your condition(s) or ailment(s) for which you think cannabis might help. Our online form asks you to check which conditions apply to you, and lists many of the most common conditions (like cancer, arthritis, seizures and migraines) for which cannabis is an effective treatment. 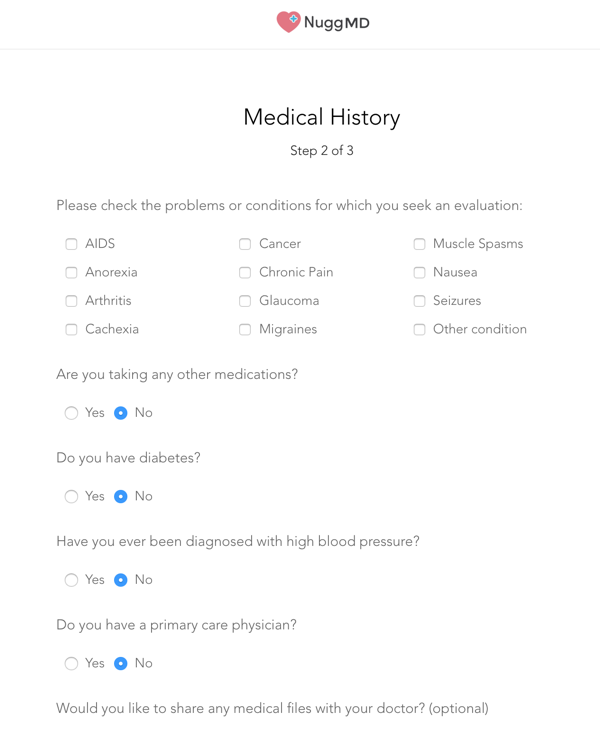 It then digs a little deeper, asking if there’s any history of disease in your family, if you smoke or drink, and if you’d like to upload any prior medical documents to help the doctor better understand your condition. These are all highly-typical questions that you’ll encounter regardless if you walk into a cannabis clinic or get your recommendation online. Once you’ve filled out all necessary information and checked the appropriate boxes, you’re brought to the payment page. Here, you’re notified that if your recommendation isn’t approved, you won’t pay anything for the consultation. That’s right. No matter what, you’ll get a free medical marijuana consultation. 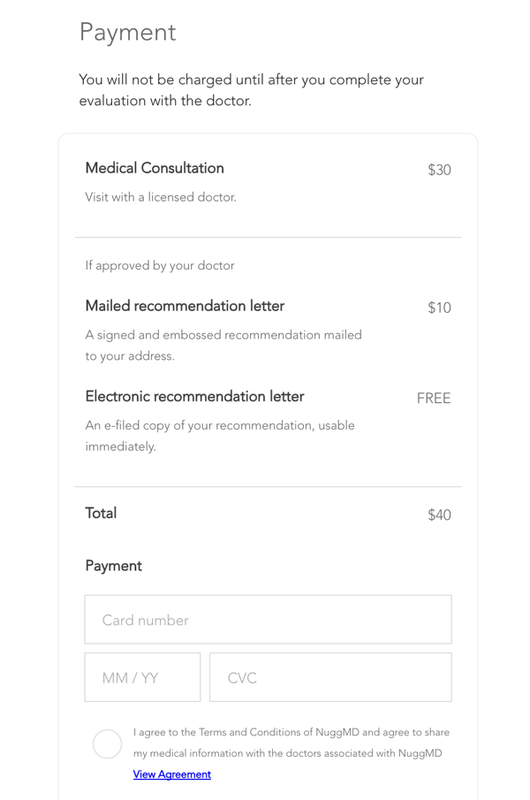 If approved, you’ll receive an instant digital copy of your medical cannabis recommendation, then a mailed physical copy a few days later for a total of $40. Our software uses the Stripe API, so you can rest easy knowing we accept all major credit cards. Enter your credit card information and hit submit to continue. Your payment information will not be processed until after you’ve seen the doctor. Then just wait a few minutes for a doctor to accept your request and review your information. Stay on the screen, wait and look out for a text and email notification when the doctor’s ready to see you (which shouldn’t be more than five minutes). When a doctor is ready, you’re able to enter the online chat room. Either click the “Enter Room” button on your screen, or click the button on screen if you’re on mobile. Please note that you must use either Firefox or Chrome as your internet browser for video-conferencing to work. If you’re on a mobile device, you’ll have to download a third party app to join your secure video-chat. Once you’ve joined the chat room, you’ll speak face-to-face with one of our friendly, licensed doctors. He or she will ask you about your condition, previous treatments and experiences with cannabis, then will ultimately make a decision as to whether you should try cannabis to treat your condition. The video consultation typically lasts 5-10 minutes, but you’re free to take as long as you need with the doctor. Once approved, you’ll receive an email notification with a PDF version of your medical marijuana recommendation. The paper copy of your cannabis rec will arrive in the mail within 3-5 business days of your online consultation. Now that you can legally get medical marijuana, the number of dispensaries, strains and other products can be overwhelming, even for the more informed cannabis patient. Don’t worry; we have that covered too. 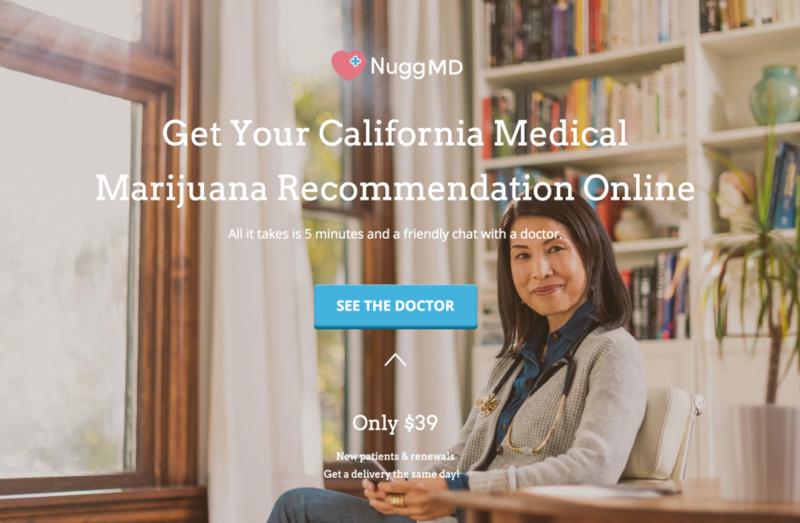 With the digital version of your marijuana rec you’re instantly verified and can order online from over 100 California medical marijuana dispensaries using Nugg. Not only that, but your account is automatically created and pre-loaded with a $20 credit for your first purchase; just login with the same email and password you used for NuggMD! So that means you can get your medical cannabis card, recommendation, evaluation, consultation, whatever you want to call it…AND get medical cannabis delivered to your door without ever leaving the couch. If you don’t think that’s the coolest thing ever, I don’t know how you made it to the end of this blog post! By introducing a convenient, private, and professional way for patients to find their way into the cannabis industry, and tying it to our existing platform for online orders, Nugg provides the first all-encompassing cannabis experience that focuses solely on the patient. So what are you waiting for? 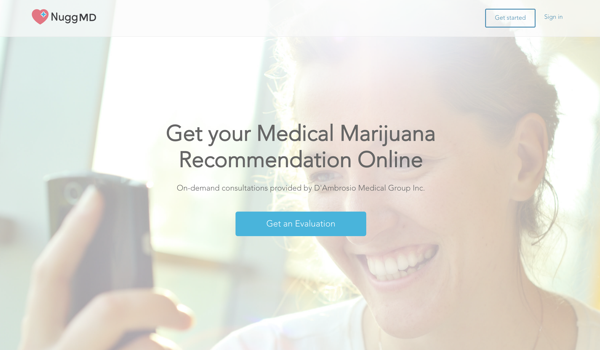 Complete your medical marijuana evaluation online today! And tell your friends to get their cannabis recommendations too! can you use this recommendation at an dispensary ? not just ones attached to nugg? That’s great that you have created a convenient and private place to get my car renewed online. Having to set up doc appointments which are often months in advance is very time consuming and not fast enough. Great info! Very nice blog, thanks for sharing this information. Despite its legalization, people still have some doubts about the use of medical marijuana. They are also wondering how to get treatment from legal dispensaries and doctors. But, your blog might be helpful for all those marijuana users. Great work! Just received my first newsletter and I’m loving it already. Thank you. If so, is it actually legal to get marijuana delivered to me in Michigan?